According to a release from the Newberg-Dundee Police Department, Robert Taylor, 46, of Washington, and his brother, Aaron Taylor, 43, of Beaverton, were flying in a 1977 McDonnell-Douglas MD500 helicopter from Beaverton to McMinnville when the aircraft lost power and Robert Taylor had to make an emergency landing. "Upon arrival, both occupants of the aircraft had exited on their own, miraculously without injury," the release said. "The pilot's quick thinking and extensive flying background can be credited for their survival of this crash." NDPD spokesman Brian Hagen said the Taylors were out of the aircraft, inspecting the wreckage when first responders arrived. "Both declined medical attention and EMS (personnel) cleared after there was no sign of injury, fire or fuel spill," he said. The aircraft came to rest on property owned by Veritas School near the intersection of Bell Road and Highway 219 in northern Newberg. Although the craft received extensive damage, it did not strike any buildings or individuals on the ground. 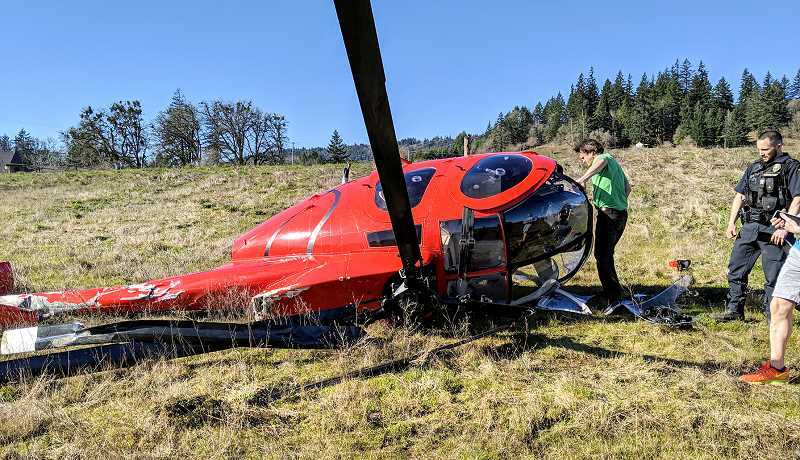 "The pilot did not know why the helicopter lost power, but reported he was at 1,000 feet of altitude when he realized the seriousness of the problem," Hagen said. Fire personnel from the Tualatin Valley Fire & Rescue department responded to the scene, but neither the aircraft nor the grass beneath it caught fire. The Federal Aviation Administration and the National Transportation Safety Board, the federal agencies responsible for investigating aircraft crashes, were contacted about the crash. "They were provided immediate photos of the scene," Hagen said. "After speaking to emergency supervisors on site and interviewing the pilot, the aircraft was released back to the pilot since there was no injury or damage to property other than the helicopter itself. It is unknown if a later mechanical evaluation will occur to try to determine the exact cause of the crash."